“Chocolate” – the mere utterance of the word can make one drool over the scrumptious bar that melts in the mouth and stimulates the taste buds to the greatest extent. If this is the case with us adults, you can well imagine why the kids get so easily lured into anything with just the name of it. But the world is essentially debating over the consumption of the sweet today. Everyone is concerned about how much sugar is to be added to the diet so that the right balance can be maintained. But how many of us really care about its impact on our teeth? This is especially true for the kids who tend to have more chocolates when the restriction is in full force. It can be the most challenging task for any parent to make their kids keep their hands-off the jar of chocolate beans. You can ask any dentist and you will come to know the kind of impact that sugar has on your teeth and that sugar is responsible for the primary cause of tooth decay in maximum cases. So here are some tips that will help you to keep your kids’ teeth and gums healthy. You should inspire your kids to brush their teeth after having chocolates. But that is something that is not possible all the time. Instead of that, a glass of water will help to wash away the sugars and the food particles away. You can also try to stimulate their mouth for producing saliva. This helps to protect their teeth from the harmful bacteria. The sugary treats between the meals have adverse effects on both the teeth and the gums and they often result in poor appetites during the meals. Under such circumstances, you should allow the little ones to smack their lips with the tasty snacks post their main meal. This should be a like a prize for eating the healthy food first. As they have already eaten, the kids will not want it that much. This way you can restrict the amount of chocolate that they have. It can be a struggle to get your kids to brush properly but if you have the patience then you will be able to install excellent habits in them that they can retain for a lifetime. Make sure you monitor their brushing technique and explain it well to the kids according to their age what can be the consequences of poor oral health and the effects that chocolates and other sweets can have on their overall health. While it is not at all advisable to allow the kids have as many chocolates as they like but restricting the amount too much can backfire on you at a later period. Instead of that, you should be generous in the number of treats that you provide them after the meal. This will ensure that the kids do not crave for more. This will also help to prevent from making them cranky over time. The right toothbrush plays a vital role in restoring the oral health of the children. In this case, the natural bristled brush especially the one that comes with a long handle for cleaning the hard-to-reach corners are ideal for the kids. But one thing that you should take care of is that they must know the right technique of brushing. They often fall short of the attention span during brushing their teeth and you should take care that this does not take a toll on their oral health. Though it is true that you will be able to get quality and affordable dental implants very easily these days you should not let your kids spoil their natural features just like that which can compel them to go for these at a later period. 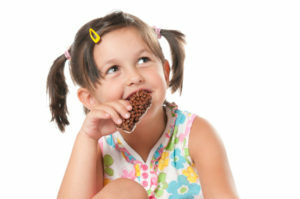 Craving for chocolates is a natural instinct that most kids have but too much of everything is bad. The above steps will help you to retain their pearly whites for a long time to come.